A great dad himself, Armin speaks not only as a specialist in parenting, but as a parent himself. Hailed by Time Magazine as "the superdad's superdad," Armin Brott has been building better fathers for more than a decade. As the author of six bestselling books on fatherhood, he's helped millions of men around the world become the fathers they want to be—and that their children need them to be. He has written for The New York Times Magazine, Newsweek, American Baby, Parenting, Child, Men's Health, The Washington Post, and dozens of other major publications and websites. Armin has been a guest on hundreds of radio and television shows, including Today, CBS Overnight, Fox News, and Politically Incorrect, and his work on fatherhood has been featured in such places as Glamour, Time, The New York Times, The Chicago Tribune, Newsday, and many others. Armin is the host of "Positive Parenting," a weekly radio program which airs in the San Francisco Bay Area and a number of other markets. He also does the "DaddyCast" podcast. As a trusted spokesperson, Armin speaks on fatherhood around the country and teaches classes for expectant and new dads. Armin lives with his wife and three children in Oakland, California. Good quality baby food is expensive and is often nothing more than just vegetables and water. So why not save lots of money by simply making your own fresh baby food? You don’t need to be a chef to steam carrots or boil peas, and with the Miallegro MiTutto 9090 Immersion Blender, you don’t need a lot of time to make healthy and wholesome baby food right at home. Everything from mashed veggies to pureed fruit can be whipped up quickly and easily. Making up food in bulk and storing it becomes a simple task with the help of the MiTutto blender. 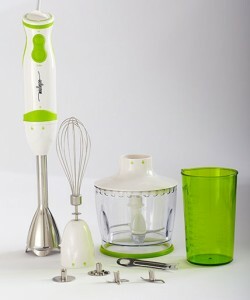 The Miallegro MiTutto 9090 Immersion Blender includes multiple attachments for various uses. Making your own baby food has never been easier. The MiTutto blender comes with multiple interchangeable attachments making it a handy and versatile kitchen tool for every day cooking. It includes a 26 oz. BPA free chopper bowl, a whisk, and four separate FDA approved stainless steel blades to cover the spectrum of food processing. The blades pop on with a bit of pressure and are pried off with a special tool. You do need to handle the blades so be careful not to cut yourself. The removal tool has a notch cut in it that fits perfectly over the shaft but is too narrow to fit over the sleeve directly under the blade, where it is intended to be placed. This appears to be the result of a spec error. But although it doesn’t fit over the sleeve, it functions nonetheless, albeit a bit awkwardly. With five speeds and a turbo function, the MiTutto can be fine-tuned for chopping, mincing, mixing, blending, pureeing, and even aerating. Clean-up is super easy. The attachments can either be rinsed under the tap or thrown in the dishwasher as they are all dishwasher safe, including the mixing bowl. You just can’t beat home cooking and making your own baby food with the help of the MiTutto is easier than you can imagine, so if you’re a dad who thinks he can’t cook, you’re wrong! The MiTutto 9090 Immersion Blender is a high quality product that encourages healthy eating and money savings. The Kelty Pathfinder 3.0 is loaded with safety and comfort features assuring a safe and happy baby and in this case, a comfortable and happy Dad. 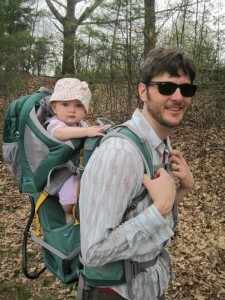 I recently tested the Kelty Pathfinder 3.0 on a hike with my seven month old daughter Rosemary. It was our first experience hiking together and we had a great time. The pack performed great and most importantly, I felt that she was perfectly secure and comfortable thanks to the pack’s many safety features and well thought out design. The Pathfinder 3.0 is relatively lightweight (7lbs 10 oz.) and has adjustments that allow you to distribute the weight of the child between the shoulder straps and the hip belt. It took a little time to get it right, but once I adjusted the hip belt properly, which is easily done with the pull of a pin, and adjusted the shoulder and sternum straps, the pack felt comfortable and natural on my back. There are multiple fit adjustments for both baby and adult, all of which are easily made. The padded adjustable child’s seat allowed me to easily position Rosemary so that she was able to see over my shoulder. She needed the highest of three adjustment points, so there is a lot of room left as she grows. The shoulder straps and leg straps are nicely padded as well and are easy to adjust. Once she was properly adjusted and strapped in, she began to coo, assuring me that she was comfortable and felt safe. It was her first time being carried in a backpack and there was no question that she was delighted. There are a lot of great features including an under-seat storage pouch, which is great for diapers, a detachable day pack, which has plenty of room for all the food and supplies necessary for a nice picnic, and a hip belt storage pouch, perfect for the camera. The detachable sun hood, which stores nicely in the detachable daypack, is a feature that my wife especially liked. Rosemary liked it too, especially when we encountered a swarm of black flies, which the sun hood sheltered her from. The Kelty Pathfinder 3.0 is a nice pack that is comfortable and well made. For long day hikes or trips around town, it is a star. My ingenious method for heating up breast milk used to consist of filling a pot with hot tap water, dropping the bottle of milk into the pot and then placing another smaller pot of hot tap water on top to keep the bottle submerged. After ten minutes or so, I’d check the milk, realize it wasn’t warm enough yet, drain the pots and start over again. Eventually, I would have a bottle of perfectly warm breast milk ready to go along with an extremely fussy and hungry baby who was ready to eat twenty minutes ago. The Kiinde Kozii has changed all of that. Now I simply place the bottle into the Kozii, turn the dial to the appropriate setting, and within minutes, the milk is ready. It couldn’t be easier. And best of all, there is no guess work. I can count on the milk being the perfect temperature every time. 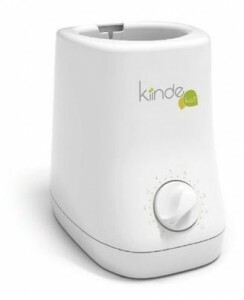 With the Kiinde Kozii breast milk warmer, you can heat up milk with the speed of steam, the safety of tap water, and the ease of a microwave. Setting up the Kozii is also a simple task. Simply fill the reservoir by pouring water into the bottle chamber, allow the water to drain, and repeat until the fill indicator at the bottom of the chamber is just under water (roughly 1 and ¾ cups). When you turn the Kozii on, the bottle chamber fills and surrounds the bottle with warm flowing water. When the warming time is up, the chamber empties and the bottle is ready. The warming time varies based on whether you are heating up frozen or thaw milk, as well as the volume of milk in the bottle. As far as which setting to use, a chart printed in the instruction booklet lists estimated warming time, although it is still recommended that you test the tempertaure of the milk before feeding. My one suggestion is that the warming chart could be printed on the side of the Kozii for a more convenient reference. There is some maintenance involved in keeping Kozii clean and working properly. It is recommended that every two or three days, you replace the water in the reservoir and every two months, you descale Kozii with a water and vinegar solution followed by rinsing with fresh water three times. This process is a bit of a chore, but relative to the hassle of heating milk each time with the double pot method that I described earlier, it is no hassle at all. And unlike the double pot heating method, it can be done after baby is fed and happily snoozing away. One thing we’ve learned about Rosemary, our three month old baby girl, is that she loves to stare at things. Especially fuzzy, hanging things. Put something fuzzy and hanging in front of her eyes and she’ll be captivated for period of time. And the more things you can dangle in front of her, the better. In an effort to keep her distracted and therefore quiet, we dangle things in front of her whenever we can. 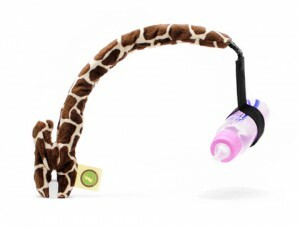 The BabyGiraffe is a multi-use accessory for holding and hanging anything from a toy to a bottle that any parent would appreciate. But not everything you place her in is outfitted with fuzzy hanging things. This is where the BabyGiraffe, a versatile holder of fuzzy things, comes in handy. It is a simple yet clever accessory that allows you to dangle fuzzy things in front of your baby just about anywhere. It uses a surprisingly powerful spring-loaded clamp that doesn’t budge once it is clamped onto something. At home, I’ve clamped it on the changing table, the swinging chair, and the crib. The flexible spine makes it easy to place the hanging object exactly where you want it and viola, baby is distracted. It is small enough to fit into a diaper bag, so we take it everywhere. As soon as we settle Rosemary in, the BabyGiraffe comes out. The idea of a gadget like this to hang things from was a great one, but the giraffe print cover was a stroke of genius. The soft material protects the surfaces it clamps to, which any fabric cover would do, but by using a giraffe motif, it is so much more fun. It was because of the giraffe print that before I even used it, I was charmed. Other than fuzzy things, the BabyGiraffe comes with a bottle holder and a mirror, which comes in super handy for rear facing car seats or front facing strollers so you can keep an eye on your baby. Or it can be positioned so your baby can stare in awe at her own reflection. At just $24.95. the BabyGiraffe is an accessory that any new parents will appreciate and use, so it makes an affordable and memorable gift. The Belle Baby Carrier is ergonomic and stylish and allows for front or rear facing positioning. When I first put on the Belle Organic Baby Carrier, I was immediately impressed with its overall stylish look. I’ve tried on other carriers that did not leave this impression, and for a hip dad like me, style is important. Of course, stylish design isn’t the most important aspect, but it is a big plus, so before I even tried it out, the Belle carrier was already receiving high marks. I believe that all baby carriers look good on moms, but this is a baby carrier that looks good on dads. More importantly, of course, is comfort for the baby and adult, and the Belle Baby Carrier, which uses a very simple crossover strap and buckle system with an independent waist belt, is surprisingly comfortable. I say “surprisingly” because it isn’t overly padded. It is padded just enough. The ergonomic design distributes the baby’s weight evenly across the straps and panels. Once you get going, it can be easily adjusted for the best fit. I took my five week old daughter for an hour long stroll and only needed to make a few slight adjustments to the shoulder straps and it was perfect. As far as my daughter, the Belle kept her close to my body for a great sense of security and bonding. Her spine remained in a natural position and she was perfectly happy. It takes a few tries to get proficient at loading and unloading your baby – it is suggested that you practice with a doll or stuffed animal – but once you get good at it, it is a relatively easy process. The Belle allows you to position your baby facing in or out, and for infants who are still working on supporting their head, the carrier has an attachable head support panel for use in the facing in position. I find that this panel also helps to keep warmth in, which is a nice bonus this time of year here in New England. Belle carriers are made in Colorado and are available in classic or organic fibers (using 100% organic cotton and hemp).